There’s a man named Butch who lives in our local nursing home. Each morning, he wheels himself outside and down to the stoplight at a busy intersection nearby. There he sits in his wheelchair for hours, smiling and waving at cars, hollering a friendly “hello” to familiar faces driving by. Know why Butch does that? Because he wakes up and makes a choice every day. He knows he can sit in his little room and think about all the things he wishes were different about his life. Or, he can get up, do what he’s still able to do, and find ways to give thanks for what he does have. A healthy mind. A way to get around. A wonderful ability to make people smile. The challenge to live gratefully is for all of us. No matter what situation we find ourselves in, we can always find a reason to say, “Thank you” to the One who gives us every breath. “As long as thanks is possible, then joy is always possible,” says Ann Voskamp, author of the life-changing book One-Thousand Gifts. There is joy to be found, not only in the good times, but in the challenges too. 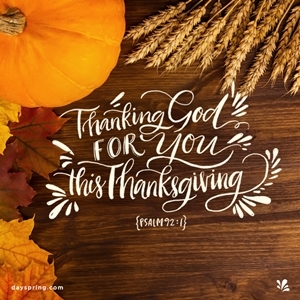 As autumn arrives, we hear those familiar reminders, “Give thanks,” “Be grateful,” and “Count your blessings.” We host celebrations, offer thankful prayers, and soon the fall wreaths and throw pillows are packed away for another year. What if this year, we kept the gratitude going all season long? Put up a few sticky notes, wear a special bracelet, light a candle or two – whatever reminds you to pause now and then amidst the daily grind to lift your heart in thanks. Begin to pay more attention to the words you speak. Do complaints come out easily? Do you hear yourself lamenting about what “woulda, coulda, shoulda” happened? Challenge yourself to turn that grumbling into gratitude. Not only will it help you lighten up, but those around you will be inspired to do the same. If you haven’t already, consider reading Ann Voskamp’s book One-Thousand Gifts, and start your own list of everyday blessings. You may discover that in giving thanks for the life you already have, you’ll begin to live the life you’ve always wanted. When our days are filled with grateful moments, our lives will shine with joy. Little by little, as we let go of negative thoughts and words and begin to focus on all the good God has placed in our lives right here, right now, the people around us will encounter the presence of Christ within us in beautiful, new ways. In the end, that’s what living gratefully is all about. The joy we seek, the peace we hope for, the difference we want to make in this world – it all falls into place when our focus changes from our circumstances to our Creator, from what we wish we had to what we’ve already been given. That’s when “thanksgiving” becomes much more than a season; it becomes a vibrant way of life. Let’s turn our focus from what we wish we had to what we’ve already been given.